The V International Summer School of Journalism and Communication (ISSJC-2017) "Media and information literacy: a New paradigm of intercultural dialogue" opened its doors on 13-15 July 2017 within the framework of the Global week of media and information literacy. 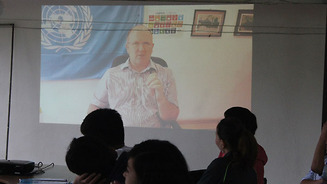 The summer school is organized by the Scientific Center for Humanitarian Studies "Mediasphere" of the Faculty of Journalism of KazNU named after al-Farabi with the support of UNESCO Almaty Cluster Office and United Nations Information Office in the Republic of Kazakhstan. UNESCO has launched an online campaign #MILCLICKS in the social networks for this future event. The program of the school includes two modules: MIL and cultural pluralism and MIL and rapprochement of culture. Training seminars and master classes on the above modules are included in three-days programme of the school. Representatives of the media and new media from Kazakhstan, Kyrgyzstan, Uzbekistan, as well as young journalists, bloggers and teacher educators from the cities of Astana, Almaty and the regions of Kazakhstan participate in the Summer School. UNESCO Almaty Officer presentated the the principles of intercultural dialogue, MIL critical thinking, human rights approach and ability to live in peace and harmony. The trainers prepared a number of group exercises and presentations. According to the participant of the school, Zhidegul Abdizhazhilzyzy: "The topic of media literacy in the context of intercultural dialogue was completely new. It was easier for me to combine critical thinking, freedom of expression with consent and universal values in exercise. The exercise caused a heated discussion among guys." Public Foundation "Center of Media Support", Kyrgyzstan; NGO Ecological Alliance "Baita Bolash", Astana; National Center for Advanced Training "Orleu", Almaty; Publishing house "Kazakh University", Almaty; Internews Network in Kazakhstan, Almaty; LLP "Management Company" Kazmedia Ortaly ", Astana; GSO Chief Editors Club, Astana; NGO "Kazakh Internet", Astana; JSC Kazkontent, Astana; RTRK "Kazakhstan", Almaty; JSC "Agency" Khabar "; PF "Minber" Center for Support of Journalists ", Almaty; Information resource ArtGeorgia, Tbilisi, Georgia; Community radio Suusamyr FM, Kyrgyzstan; Community radio "Radiomost", Kyrgyzstan; Genesis MCN Youtube Kazakhstan, Almaty; Atameken Business Channel, Almaty; TRK KazNU im. Al-Farabi.